Bowden and Abbey were both fearless, larger-than-life types with a taste for tequila, an eye for women and a big problem with authority. Charles Bowden was a notorious walker-outer. Obituaries of the celebrated writer, who died in 2014, often note that he walked out of his own dissertation defense, irritated by his professors’ questions. In his introduction to The Red Caddy, Luis Urrea recalls Bowden cutting short their first encounter in a Tucson bar, in spite of Urrea having thoughtfully brought with him a monstrous ex-Hells Angel to keep Bowden entertained. And the main plot device in this slim, colorful book involves Bowden’s ability, or lack thereof, to suffer through and not quit a scholarly panel he has been “browbeaten, outmaneuvered, and cowed” into moderating on his friend, fellow desert rat and author Edward Abbey. This book, written five years after Abbey’s 1989 death and discovered after Bowden’s own, also teases us with the following implied question: If Cactus Ed is to have a literary and spiritual successor, should it not by all rights be Chuck Bowden? When someone suggests as much, Bowden reacts with “mock anger” at the idea: An original cannot be replaced. Yet much of the book is taken up with Bowden showing how he and Abbey were cut from the same rawhide. They were both fearless, larger-than-life types with a taste for tequila, an eye for women and a big problem with authority. They both abandoned academia back East for life in the rugged Southwest, where they became environmentalists and nature writers, terms they nevertheless rejected as not quite macho enough to describe what they were about. What was Abbey’s and Bowden’s conservationism about, then? Why were they drawn to live in, write about and so fiercely defend wild places? Abbey, in his 1971 essay “How It Was,” uses italics to emphasize a fundamental reason people like him are so keen on the wild: “because we like the taste of freedom; because we like the smell of danger.” The wilderness gives them a taste of the sublime, without which life is hardly worth living. Bowden’s later writing upped the danger ante as he went to Juárez and other narco killing fields to report firsthand on violence almost sublime in its hideousness. If Cactus Ed is to have a literary and spiritual successor, should it not by all rights be Chuck Bowden? 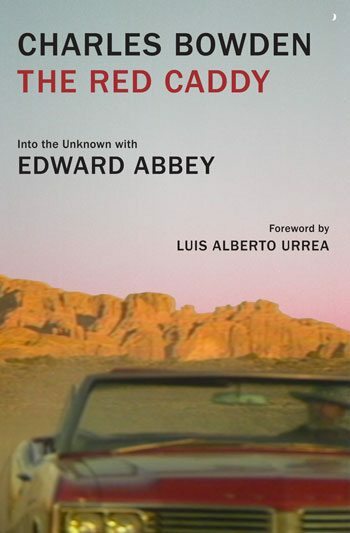 Like the red convertible Eldorado Cadillac he drove, Abbey was colorful, potent and rakish; but seriously, to name a book about an ecologist after a gas-guzzler? Well, yes, if you know what shade of green Abbey was, which was dark indeed. A “light green” environmentalist believes in recycling and such as “lifestyle” choices, and a “bright green” one believes in implementing new clean technologies to replace the unsustainable dirty ones; but the dark green ecologist believes only a fundamental change in societal values leading to the overthrow of techno-capitalism, or what Abbey called Industrial Civilization, can end the ecological crisis. Until this revolution, until the ontological divide between humans and nonhumans is erased, there’s not much hope (though a little monkey-wrenching might be psychologically satisfying in the meantime.) “Even as [Abbey] railed against the despoliation of the natural world, he reveled in long car trips on which he measured distance not in miles but in six-packs, tossing his empty beer cans out the window,” Bowden writes. So what’s a little litter compared to genetic engineering, the A-bomb and global warming? Though Bowden and Abbey fully agree, and find the Southwest deserts awesome places for the revelation of the Mystery, they also saw them as standing reserves for acting out their macho fantasies. Heidegger, the deep ecologists’ favorite philosopher, deplored techno-civilization’s reduction of the natural world to a mere “standing reserve” for exploitation, which he believed led to the “oblivion of Being.” Though Bowden and Abbey fully agree, and find the Southwest deserts awesome places for the revelation of the Mystery, they also saw them as standing reserves for acting out their macho fantasies. Fortunately, Bowden is able to prevent any such observation from the conference audience, springing from his chair “like a panther” to shut down the Q&A before it can start and heading to the bar to “drink strong water.” Which, we presume, is exactly what Ed would’ve done. José Skinner’s latest fiction appears in the anthology Buffalo Cactus and Other New Stories from the Southwest.